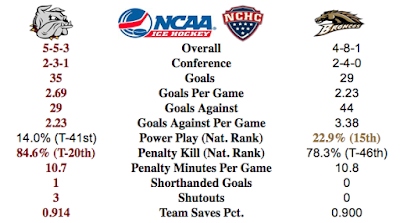 Since the inception of the NCHC, it is Western that has been the most puzzling team for UMD to solve. Their size, their trap, their slow-it-down slug-it-out style frustrate the speedy Bulldogs. 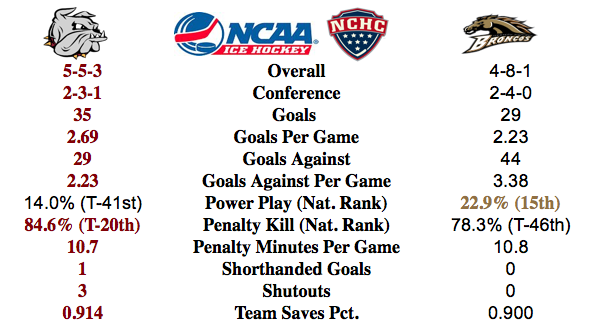 Nebraska-Omaha, arguably one of best teams in the NCHC, is a team much like UMD, fast and talented. Their only loses of the season are against the Broncos of Western Michigan. And UNO is a beefy 11-2-1 overall. UMD needs to stay patient and not press too hard this weekend, because that is when WMU scores, when the opponent leaves an odd-man rush opportunity. Unfortunately, UMD can't afford many more losses and this weekend will be a challenge for them. The Bulldogs return to action this weekend after a weekend of rest. In their most recent Bulldog series against the Colorado College Tigers the Bulldogs did exactly what they should playing a less talented team, two shutout wins. This weekend will be much tougher playing the Broncos from Western Michigan who play style of hockey that can be difficult for UMD to handle. Hopefully the rest will have the Bulldogs playing fast paced and sticking to their game plan dictating the tempo. Western Michigan @ Minnesota Duluth: The Broncos have not been good on the road and the Bulldogs haven't been very good at home. The Bulldogs should get a sweep, but until they show me they can win two in a row at home I will pick a split. Denver @ North Dakota: Both teams a playing very good hockey right now and this will a great series. Home ice favors the Fighting Hawks, but the Pioneers will earn a split. Nebraska Omaha @ St Cloud State: Another great NCHC series. Both teams are hot so this series will end in a split. Miami @ Colorado College: Last weekend The Tigers picked up their first win of the season. Maybe this will provide some momentum into this weekend. Until the Tigers win a conference game I will pick against them, Redhawks sweep.